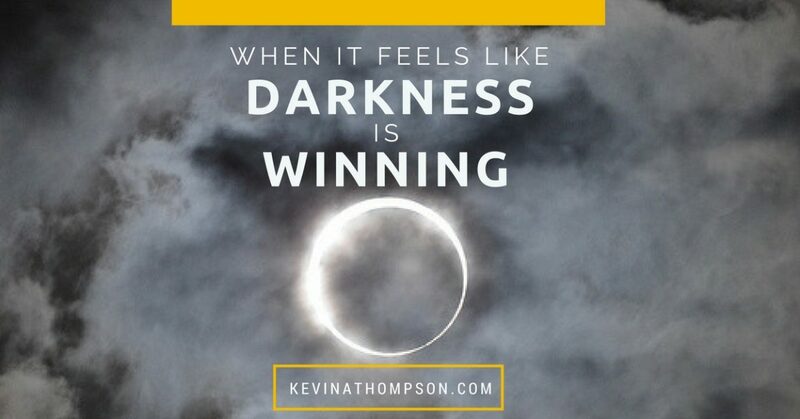 There are days in which it feels like darkness is winning. You fight as hard as you can to save the marriage, but it ends. The common symptoms have an uncommon diagnosis. As you are grieving one tragedy, another occurs. Every flip of the channel shows a new angle on evil in the world. As the calendar changes, your body shows signs of decay. There are moments in which the light is fading and it seems as though darkness is taking over. For others, it’s false. There are times when the light seems dim, but it never fully goes out, and no matter the current circumstance, the future is certain to be brighter. Have you ever considered how scary an eclipse would be if you didn’t know what was going on. Every day, life went the same way–the sun rose, the sun set. Life revolves around the rhythm. While cloud cover and differing seasons might change the brightness or longevity of the sunshine, it doesn’t greatly alter the pattern. Until one day you notice something is different. At first you think a storm might be approaching, but there isn’t a cloud in the sky. Maybe you’ve worked longer than you thought, but your watch shows it’s still midday. You can’t figure out what is going on until you look up in the sky and see a sight you’ve never seen before–the dark side of the moon is overtaking the sun. It’s terrifying. With each passing second the darkness is growing and the light is fading until eventually we see nothing but a dim haze. Gone is the clarity which the light brings. Shadows and uncertainty abound. With a little patience and a little time, the sun returns. An eclipse is a good metaphor for life from a Christian perspective. There was a time in which darkness did not exist. Creation was beautiful. There will be a time in which darkness will be no more. Heaven will be better than we can imagine. Yet we currently live in the middle. Prevent us from denying the pain in our lives. Empower us to maintain hope. Both are necessary. We should always live somewhere between denial and despair. We can have the courage to confront evil while not giving way to it. We can admit our weariness of sorrow while continuing to face it because we know it will eventually end. I sooo love this!!!! Thank you for always reminding us there is hope in our Heavenly Father. Thank you. I really enjoy reading your articles.